Citation Information: J Clin Invest. 2006;116(3):571-580. https://doi.org/10.1172/JCI27989. PPARα is a nuclear receptor that regulates liver and skeletal muscle lipid metabolism as well as glucose homeostasis. Acting as a molecular sensor of endogenous fatty acids (FAs) and their derivatives, this ligand-activated transcription factor regulates the expression of genes encoding enzymes and transport proteins controlling lipid homeostasis, thereby stimulating FA oxidation and improving lipoprotein metabolism. PPARα also exerts pleiotropic antiinflammatory and antiproliferative effects and prevents the proatherogenic effects of cholesterol accumulation in macrophages by stimulating cholesterol efflux. 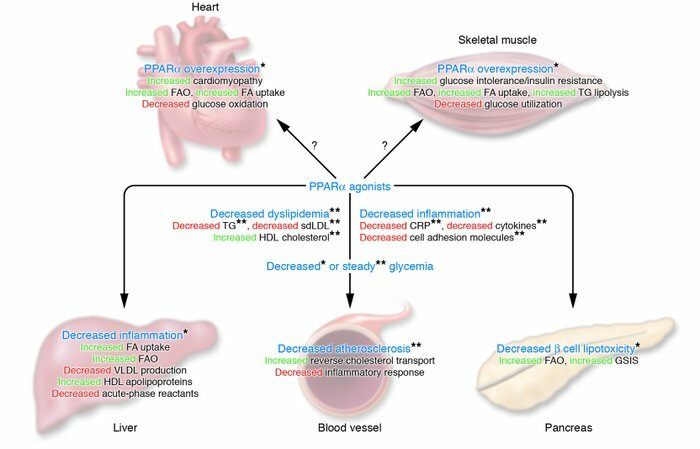 Cellular and animal models of PPARα help explain the clinical actions of fibrates, synthetic PPARα agonists used to treat dyslipidemia and reduce cardiovascular disease and its complications in patients with the metabolic syndrome. Although these preclinical studies cannot predict all of the effects of PPARα in humans, recent findings have revealed potential adverse effects of PPARα action, underlining the need for further study. This Review will focus on the mechanisms of action of PPARα in metabolic diseases and their associated vascular pathologies. Metabolic actions of PPARα and potential pathophysiological consequences. The main effects of PPARα overexpression or of PPARα ligands in mice (denoted by a single asterisk) and in humans (denoted by a double asterisk) are shown. GSIS, glucose-stimulated insulin secretion.